CPU core load in not equaly devided / utilized on all 3 cores. That makes my server LAG and cause high PING when i have more than 20 players on server running COD2 eXtreme 2.9 mod. 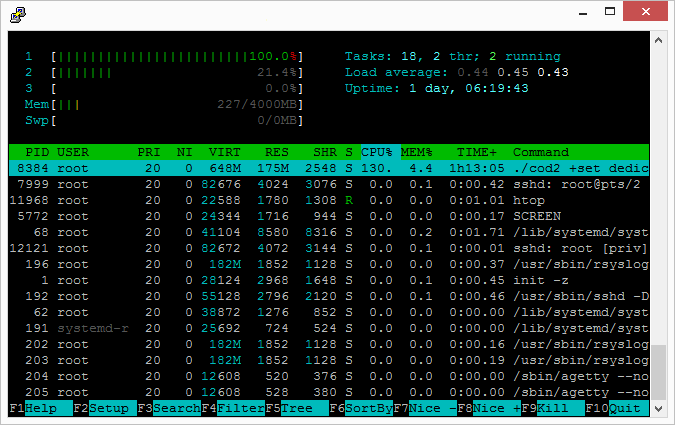 ... just 1 of 3 cores is utilized , second and third core is in iddle state, doing almost nothing..
it worked perfectly (all 3 cores had equal load on them), but now i can't make it work on new VPS. Last edited by croat1986; 16th November 2018 at 19:13. I'm not sure, but I guess the player-player-collision is what causes lots of CPU stress. The algorithm is totally stupid, like testing each player against every other player... might be possible to just deactivate player-player collision via libcod and tell us if that works. Whatever you decide for, there is no easy road I guess, all takes some work to master. COD 2 camed out 6 month after first dual (multi) - core CPU was made. But how the f... hell it was working on NFO on their VPS on all cores ... ??? Last edited by croat1986; 16th November 2018 at 20:14. How and where do i put that command ? You can use it now via the cvar 'g_playerCollision' located in https://github.com/voron00/libcod/bl...ter/libcod.cpp.